The Black Mall is a directory of black-owned businesses. CHATHAM — A project that aims to bring more customers to black-owned businesses has made a temporary home on 79th Street. 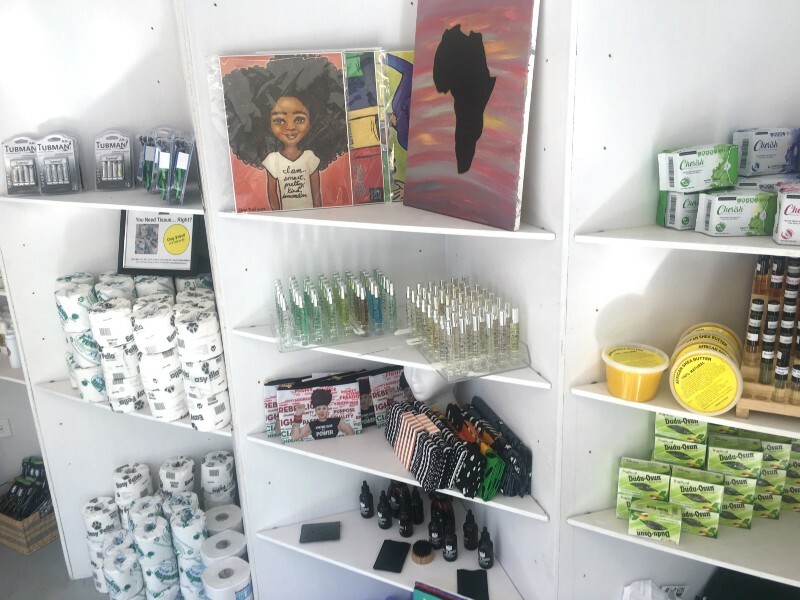 Founders of the The Black Mall, a directory of black-owned businesses, have opened up a new shop featuring goods made by black-owned businesses in the Boombox Chatham space at 532 E. 79th St. on the busy South Side corridor. Inside the storefront, comic books, t-shirts, natural beauty products, vegan deodorant, cookies and hand crafted jewelry from a variety of vendors are among the products for sale. Meekins and fellow The Black Mall co-founder, Cassiopeia Uhuru, launched The Black Mall in Nov. 2011 because the duo was in search of a meal in their neighborhood and weren’t sure exactly where to go to support a black-owned restaurant. The evolution of The Black Mall to include more than restaurants in its business coverage was spurred by a request made by the late Ronald “Kwesi” Harris, the former director of the African American Male Resource Center at Chicago State University, Uhuru recalled. Harris asked for the duo’s help in securing local vendors for a marketplace event he was hosting as part of a Kwanzaa celebration. Through their research Uhuru and Meekins learned there were a wealth of black-owned businesses that existed across the city that weren’t housed in storefronts. “We decided to host on our marketplaces and we found that those marketplaces only happen during celebration times, Kwanzaa, Juneteenth. And we were like, ‘These people need to be able to exchange their goods and wears all the time’ so we started to host a market monthly with them,” Uhuru said. Today, their nationwide business directory features 2,000 black-owned businesses. The value of supporting black business goes beyond being a positive trend and can make a true impact on the economy in African American communities, Uhuru said. The Black Mall at Boombox Chatham is open 10 a.m.-7 p.m. Monday-Thursday and 11 a.m.-7 p.m. Friday and Saturday. The shop is closed on Sundays. The Black Mall is the latest business to take advantage of the unique Boombox Chatham space since it was made available to entrepreneurs and small business owners in October. Managed by Latent Design in partnership with the city’s Department of Transportation’s Make Way for People program and the city’s Department of Planning and Development’s Retail Thrive Zone Initiative, Boombox aims to encourage the growth of small business and entrepreneurship. Latent Design also worked with Greater Chatham Initiative to bring the space to life, said Latent Design founder Katherine Darnstadt. Pop-up Boombox locations are available for vendors to use for up to three months. The physical structure is a prefabricated, climate controlled storefront made out of a recycled shipping container. Eggroll, Vision Boutique and Transitions Beauty. In addition to the Chatham space, Boombox has pop-up spaces stationed in at 5846 W. Chicago Ave. in Austin, at 833 W. 63rd St. in Englewood and at 1262 N. Milwaukee Ave. in Wicker Park.